If you have been putting off repairs for your underground pipes, we have great news! Topeka customers have the option of the newest technology-epoxy lined pipes. No more tearing up the ground or destroying landscape for your business or home. We can make one entry hole to resolve leaks or replace pipes. We can fix in a couple of days, what used to take much longer. Our specially trained technicians work cleanly and quickly to solve plumbing problems in the Topeka area. The new process of epoxy lined pipes is the best way to repair or restore your sewer system. We use cameras to determine exactly what the problem is with your pipes. We initially clean out the existing pipes, while inspecting the condition and flow found there. We use specialized tools to focus our work on damaged areas. New technology allows us to then create a “pipe within a pipe.” Our trained technicians will use a small tool to spray an epoxy inside your already existing pipework. This epoxy is a liquid plastic that will harden quickly, sealing any tiny holes and leaks. The best part of this new technique is the minimal disturbance to your yard or business. We don’t have to bring in large machinery to dig deep trenches in your area. This saves you time and money as the new trenchless system can be done efficiently and faster. Small leaks caused by roots or other debris may not be noticeable at first, but there are some indicators you can watch for. If you have noticed sounds of running water on the walls, standing water near slabs or a high water bill, you could have leaking pipes. Failing pipes can lead to flooding, sewer back up and costly repairs. 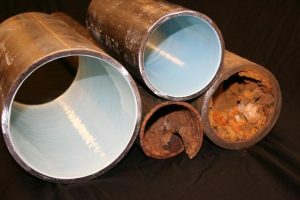 Are Epoxy Line Pipes Durable? The new technology pipes were created to stand alone under load bearing structures such as roadways and railways. The lined epoxy pipes can withstand time and weight, and we will guarantee them with a 50-year warranty. The newly lined pipes only decrease the diameter of the existing pipe by about 5 %, so there is no restriction of flow. Let us come in and inspect your current pipe system. If we find problems, there will be no costly excavation of your yard or business. We will use cutting edge technology to pinpoint the problem and then we will go in with operational efficiency to install epoxy into your existing pipes. With just a few small holes and a day for the plastic to harden, our process will be natural and non-invasive in your yard or business. You will also have the peace of mind of knowing that your new epoxy lined pipes will last a lifetime. Don’t put off your system evaluation any longer. Call us and let us take care of it for you. You will be amazed at the ease and efficiency of our cutting edge technology for your plumbing needs!